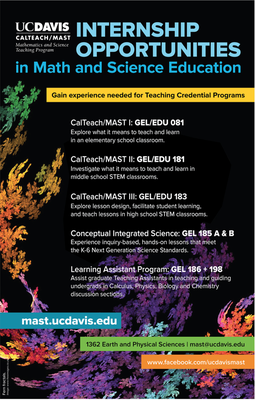 The UC Davis CalTeach/Mathematics and Science Teaching Program (CalTeach/MAST) provides students with opportunities to explore careers in K-12 mathematics and science education while completing their degree in a STEM field. CalTeach/MAST offers seminar/internship courses that will expose you to teaching methods and practices in local area elementary, middle or high school classrooms. Our courses will give you the opportunity to acquire required internship hours to enter a teacher education credential program at either a UC or CSU campus. To learn more about the CalTeach/MAST program and how it can help you to become a teacher visit the CalTeach/MAST website.